Citrus season is in full swing, and we are making the most of it! From sweets, to savory entrees, to light and fresh recipes like this Asian Style Citrus Salad – there are endless ways to enjoy these bright and tangy fruits. As warmer days approach, we are feeling ready for lighter foods, summer fruits, and fabulous meals enjoyed outdoors among friends. 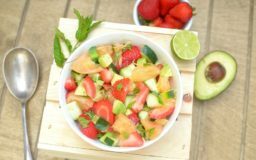 This beautiful Minty Strawberry Avocado Salad with Citrus fits that description, and is the perfect side dish to serve all Summer long. This recipe originally appeared on the blog, Athletic Avocado, which is run by local bloggers, Bethany and Rachel. Enjoy! Soft, tangy and speckled with orange, this citrus-infused treat pairs perfectly with your morning coffee and offers a fabulous finishing touch to any meal…. Bright citrus flavors, organic kale and wild-caught sockeye salmon pair together for a heart healthy meal, ready in just 30 minutes.